The Work 2.0 Middle East conference and exhibition opened its doors today to professionals from around the world. The show is taking place at Le Méridien Conference Centre, Dubai and is the region’s only event dedicated to the changing nature of work and the technologies that are transforming the workplace. 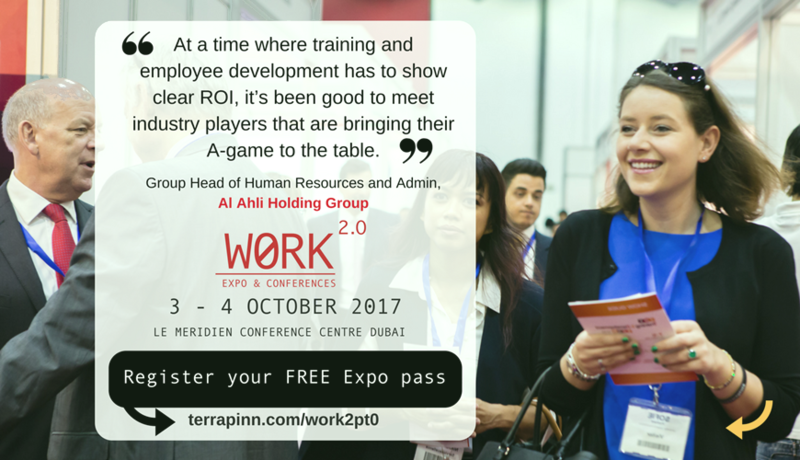 The event incorporates four co-located conferences; The Future of Work, Learning@Work, Wellness@Work and HR Tech. These conferences cover traditional ‘hot topics’ including company culture, employee engagement, and retaining and attracting top talent, as well as innovative and groundbreaking sessions on workforce 2030, state-of-the-art corporate real estate and the rise of disruptive digital technology and analytics. The Federal Authority of Government Human Resources (FAHR) are the official government partner of the event, alongside sponsors; Microsoft Gulf, Manipal Executive Education, MTa Learning and Office Inspirations. Partners supporting the event include Middle East Facility Management Association (MEFMA), CLO-ME and Right Selection. Alongside experiencing the latest cutting-edge solutions in enterprise mobility, modern workspace design and more, visitors to the exhibition today got the opportunity to get involved in interactive activities, including live team building Escape Hunt quests, a free on-floor yoga session and a Brain Fitness Bootcamp.